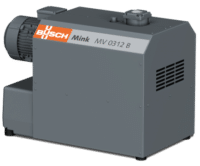 A rotary vane vacuum pump has an eccentrically installed rotor and vanes that divides the working chamber into two separate compartments with different volumes. As the rotor turns, gas flows into the enlarging suction chamber until it is sealed off by the second vane. The outlet valve is oil sealed. When the valve is open, a small amount of the oil goes into the suction chamber. The oil both lubricates and seals the vanes against the housing. Dry rotary vane vacuum pumps have self-lubricating graphite vanes which require no operating fluid. The compression occurs as part of a completely dry process. These types of rotary vane vacuum pumps have a consistently high vacuum level through continuous operation. They contain special graphite vanes in the compression chamber and have great heat discharge. Rotary Claw vacuum pumps use two claw shaped rotors turn in opposite directions inside the housing. The shape of the claw rotors causes the air or gas to be sucked in, compressed and then discharged. The rotors do not come in contact with each other or the cylinder they are in. The tight clearances optimize the internal seal and provide a consistently high pumping speed. Claw vacuum pumps are best suited to use with frequency controlled drives. Dry screw vacuum pumps operate with two screw rotors rotating in opposite directions. This traps the medium to be pumped between the cylinder and the screw chambers and transports it to the gas discharge. The screw design results in lower electric energy consumption. It also results in a lower heat load of the compressed gas. We ensure optimum performance by considering process variables, specific measurements, special legislative requirements and environmental factors such as local climate during the design process of every system. Combining the correct product selection with the most suitable operating principles and construction materials optimizes other important characteristics such as energy efficiency and longevity. Vacuum boosters are used to “supercharge” vacuum pumps to greatly extend pump performance. This allows for much faster pumping speeds and deeper vacuum levels. Utilized in the manufacture of chemicals, petrochemicals, plastics, semiconductors, wood composites as well as food processing, vacuum furnace applications and many other general applications in industry use. Anest Iwata for dry scroll vacuum pumps. Tuthill (M-D Pneumatics) for positive displacement blowers and vacuum boosters.